Wait...let me explain. I love pinterest (don't we all) and I was just sitting there when this cozy came across my feed. This lady had created the cutest (but a little plain) tissue box cozy that looked like a nice neat stack of books. What a great present for my twins' teacher! 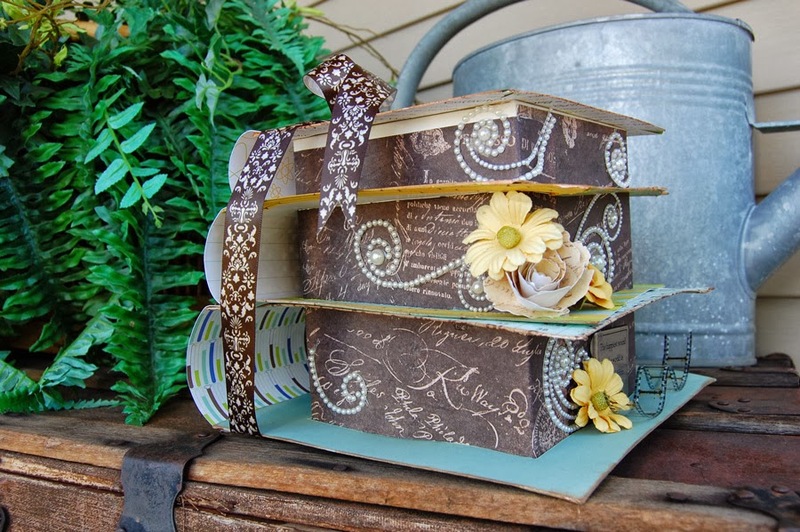 Now I KNOW that I could do something like that Andiepants style so I found another image of altered stacked boxes/drawers that looked like random stacked books with lots of shabby and lots of chic. 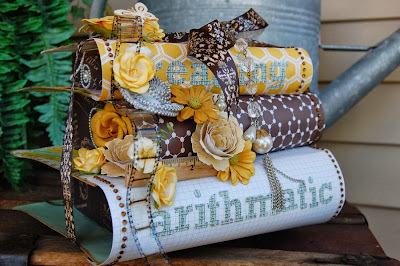 I was going to make a tissue box cozy that looked like random stacked books. 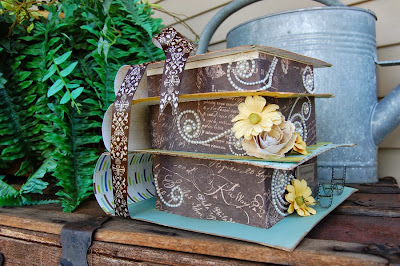 I was going to take the main idea from each and combine them to make...an altered box!!!! OK...so how did I make this adorably shabby piece of art?! First I started with poster board. 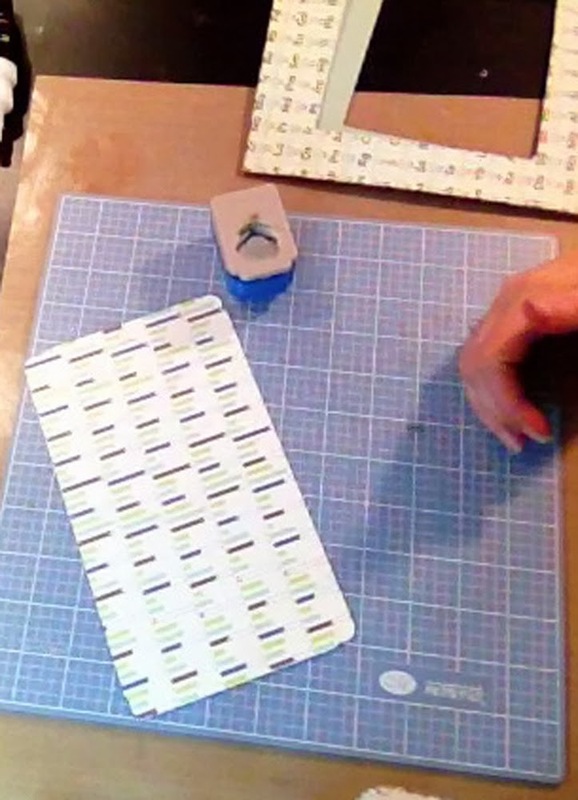 Cut a strip that is about 7" tall x 21.5" long. Starting at one end score at every 5.25" inches. This should leave a 1/2" strip at the end. 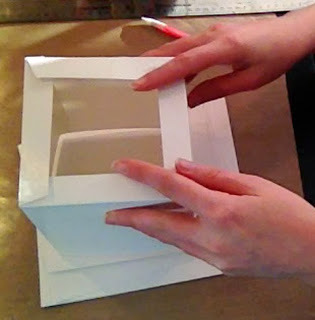 *Crafty Andie's hot tip: Instead of 7" tall you can make it a tad shorter which will allow you to cover the box using one piece of 12x12 cut in half. Just measure your tissue box. 1. Along each score line measure 1/2" down from the top. 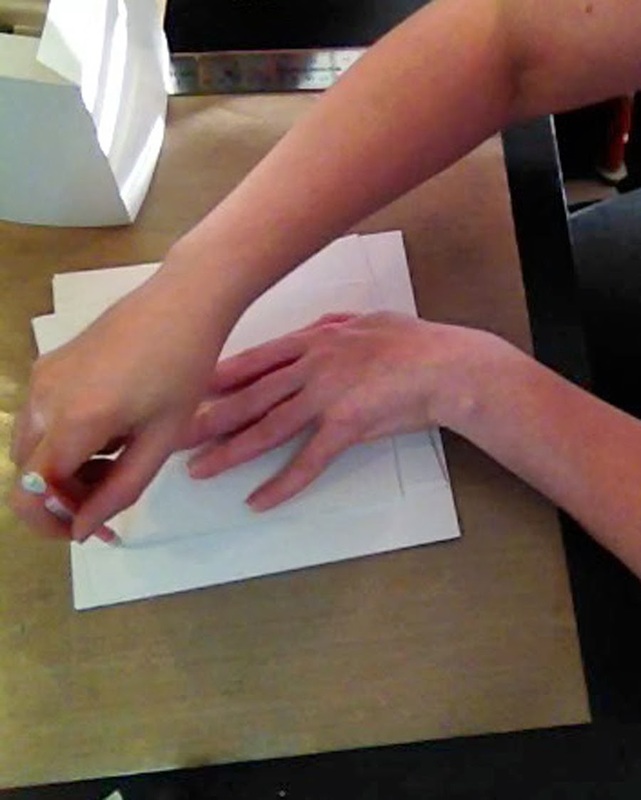 Use a ruler/yard stick to connect the bottoms fo these 1/2" lines and then score along this line. Cut down on each 1/2" line. These you will fold in to make the top of the box. 2. Fold your box together and apply glue to the 1/2" flap. 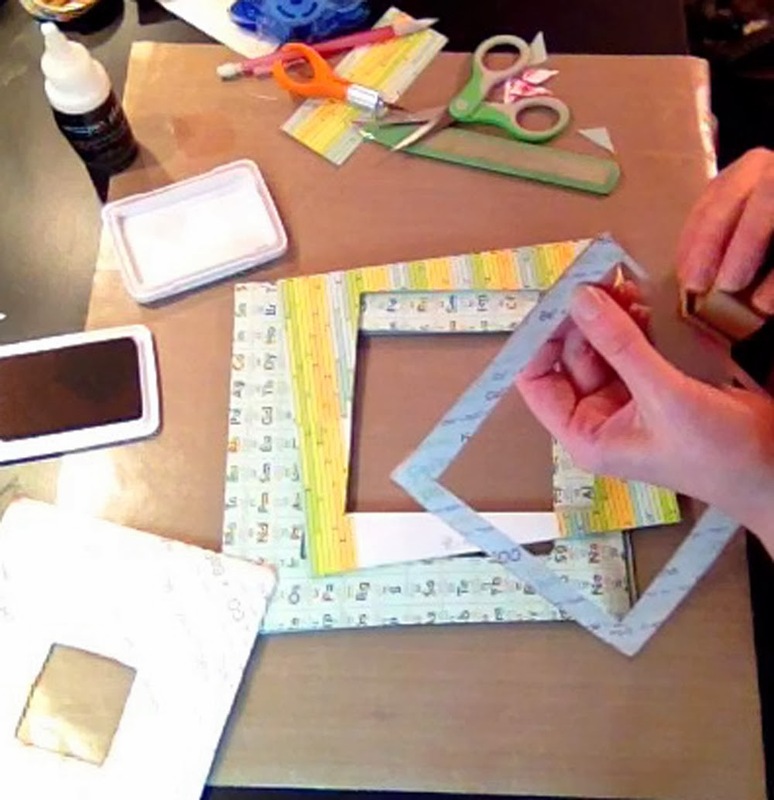 Fold each one of the small 1/2" flaps and glue them to one another. You should now have a box that will cover a tissue box. 3. Decide what sizes you would like your "books". 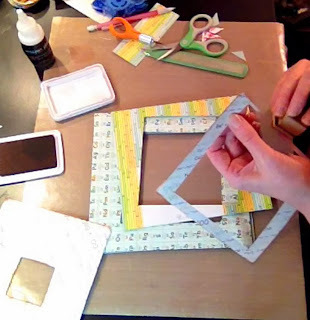 I chose 7"x5.75", 7"x8", and 8x8.5" *Crafty Andie's hot tip! Don't make the top book too small. I ended up with a very small edge to work with which made it very difficult. Next time I would make it a little larger. 4.Once you have figured your sizes, go ahead and cut 2 pieces of posterboard for each size. One piece for the top and one piece for the bottom. 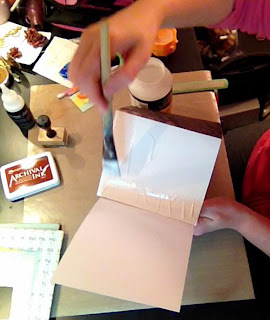 You can use a thicker chipboard for this step if you wish your "books" to be a tad sturdier. 5. Organize your "books" starting with the largest on the bottom. figure how you would like them skewed (or lined up straight). Place your tissue box on top to make sure that 1. the "books" will fit around the tissue box and 2. nothing is hanging off the edge. Use a pencil and trace the tissue box on the top book, trace the top book onto the center, and trace the center book onto the last book. 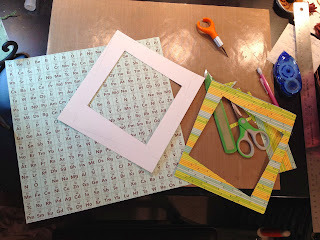 *hot tip: because the posterboard bowed outward on the box, I used the box to mark my corners then used a ruler, measured the actual length of the box, and use my ruler and measurements to draw out the shape on the top "book". 7. Use an exacto knife and cut out the hole for each book set. 8. Now it's time to cover your books. I only had 1 piece of each paper so I had to try to cover both sides of my book. GET 2 SHEETS OF EACH PAPER!!! Trust me on this one. 10. Once all the pieces of your books have been covered, edge them with ink for a semi-distresssed look. 11. 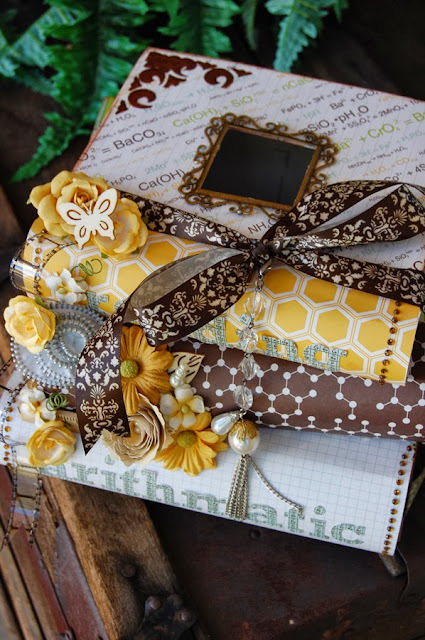 Use Mod Podge or Matte medium to wrap your tissue box. 12. 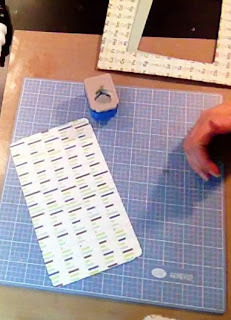 Cut the pieces for your book bindings. I did 3 inches for the large one and 2" each for the smaller. Make sure you add an inch overlay for each cover. Therefore...my binding for my big book would be 8.5" long by 5" wide. Punch the corners for a decorative look. 13. Adhere the bindings with the 1" overlap. If the binding pieces overlap into the hole for the box, use and exacto knife to cut them out. 14. Slide your finished books onto your box and adhere them bottom to top. Then them to the edges of the tissue box. Use a bullet level to make sure they are straight. 16. Embellish with gorgeous eP embellishments and you're done!!! Papers are by Jillibean soup. You can get some adorable Jillibean embellies from the eP store! I hope you enjoyed this little tutorial and I hope you decide to try one for yourself. Pure genius!! I absolutely love this!! So stunning , gorgeous colors and embellishments !! This is so awesome, love the colors...what a great combination; and the prints are so cool !! Do you hear my applase! This is just FANTASTIC and absolutely Brilliant! I had to laugh right at the start..... yes, I know what you mean about someone mentioning "Cozy" and getting a little "gaggy".....too funny. Seriously girl, this is stunning and "cozy" does not come to mind seeing this wonderful creation. Awesome work of art!!!!! Tissue box? Really? If I didn't see your tutorial, I wouldn't of believed it! Awesome!